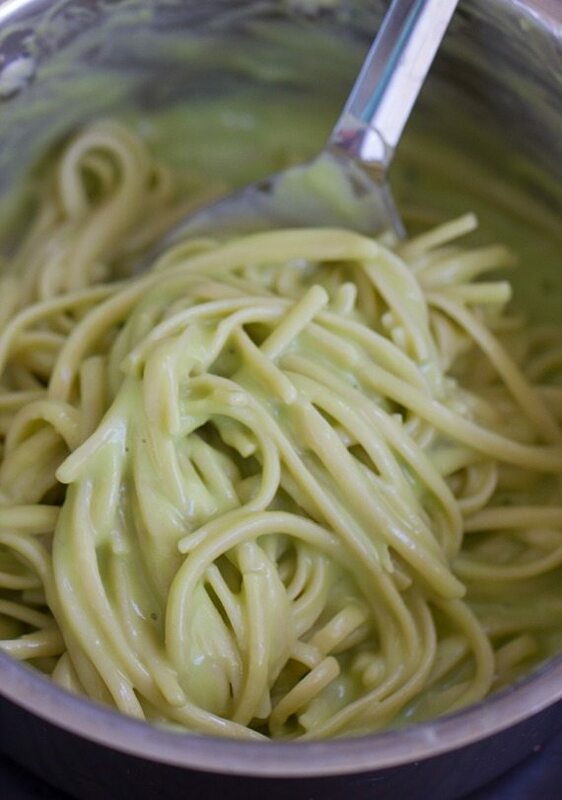 Avocado Alfredo Pasta - ULTRA Creamy! 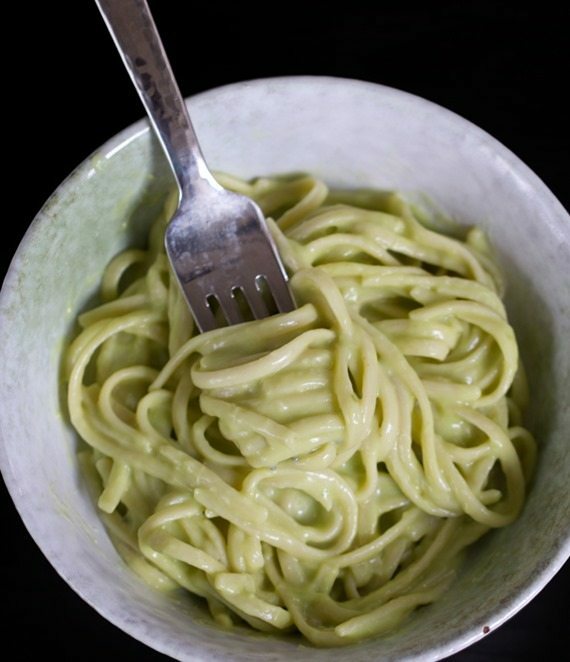 As soon as you taste it, you’ll swear this creamy avocado alfredo sauce must be made with a ton of heavy cream… But there’s actually NO heavy cream in the entire recipe! ♥ It’s a low-calorie meatless meal that’s surprisingly high in protein and can be made in under 20 minutes, from start to finish! For the past two years, I have been so in love with avocados and will go through at least one a week, mashing them and spreading on tortillas, scooping them straight from the skin, or adding them to everything from Avocado Smoothies, to Avocado Mayonnaise, to Avocado Chocolate Mousse, to one of my favorite recipes in the Chocolate Covered Katie Cookbook—The Chocolate Mudslide. 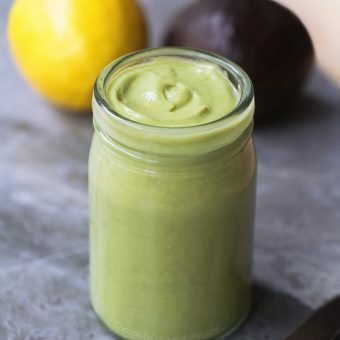 Avocados have a thick and creamy texture that lends itself so well to both sweet and savory recipes, and they’re a fantastic healthy replacement for heavy cream. Very low in saturated fat, avocados are an excellent source of the good monounsaturated fat that—when eaten as part of a healthy diet—has been shown to lower one’s risk of both heart disease and cholesterol. And if you’re worried about the calories in avocado, numerous studies have shown that people who eat them as part of a balanced diet feel more full after a meal and can actually end up losing weight! That doesn’t mean avocados are only for people interested in losing weight. These nutrient powerhouses offer almost 20 vitamins and minerals to everyone, including Vitamin K, Vitamin E, folate, copper, and potassium. Plus, they are low in sugar and high in fiber! 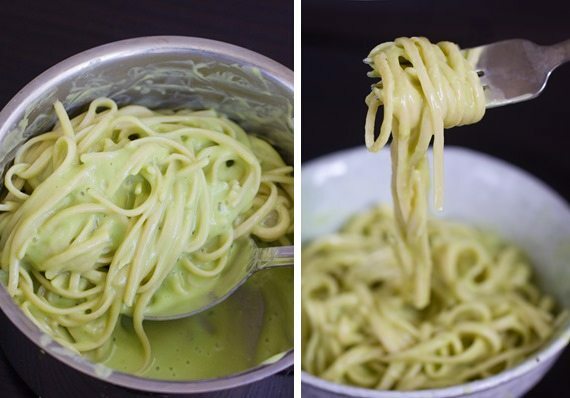 Replacing the heavy cream in traditional alfredo sauce with avocado is not only a much healthier choice, it also happens to be delicious! 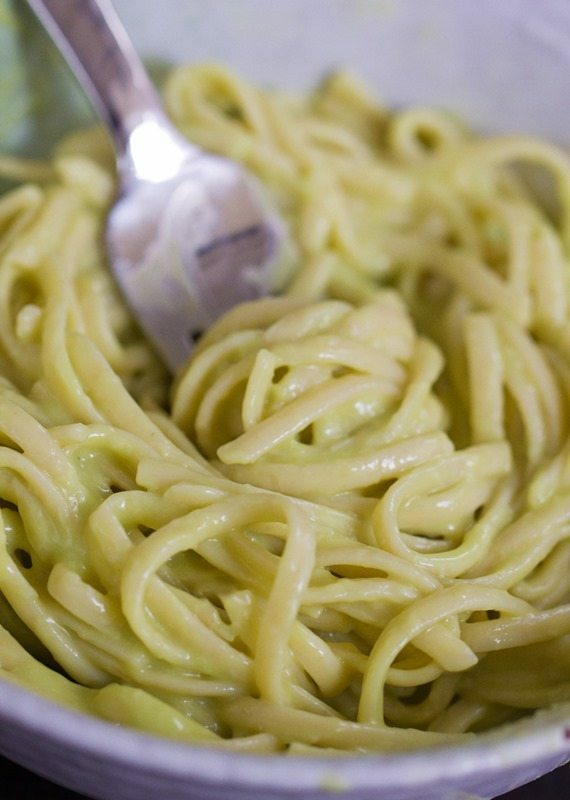 You’ll want to eat a double batch of this avocado alfredo for sure. 8 oz uncooked noodles OR spaghetti squash, black bean pasta, steamed veggies, etc. Whisk the first 4 ingredients and optional oil in a small saucepan. (For a smoother and creamier sauce, blend or use a hand blender to blend until smooth.) If making pasta, bring a separate pot of salted water to a boil. Once boiling, cook pasta according to package directions. Drain fully (do not rinse with water), then set aside. Heat the first small saucepan until sauce thickens and begins to boil, then stir in the pasta and remove from the heat. Serve immediately, sprinkling with nutritional yeast or Parmesan if desired. If you haven’t seen the articles going around facebook yet, trust me… you do NOT want to know what is in a Starbucks Pumpkin Spice Latte! 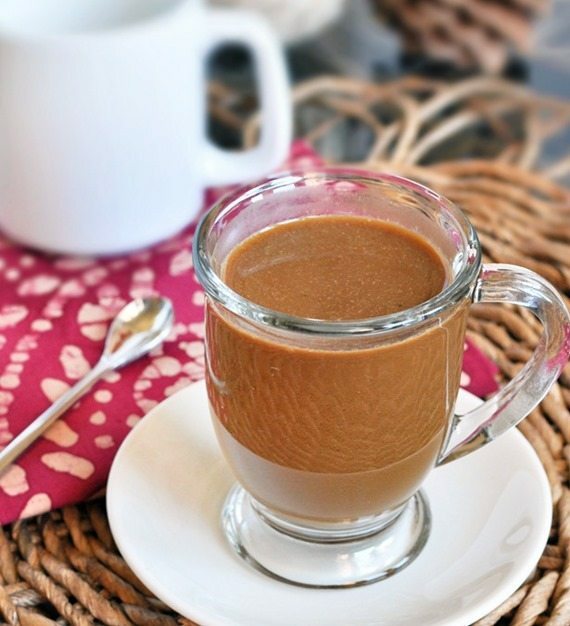 Make your own healthy pumpkin spice latte at home with just a few all-natural ingredients, nothing artificial and no high fructose corn syrup. It is really easy and tastes delicious!!! Please Tell us what YOU use in these choices!!! What is the result in your photo? What “milk of choice” did YOU use? What oil or buttery spread did YOU use? You cant show a photo and talk of how awesome it is without saying exactly what YOU used! Everyone is aware they can susbstitute things wherever they want. If you are going to have a blog of your favorite recipes– enough already of “milk of choice”, “oil/fat of choice” “pasta of choice” —- that is NOT portraying your authentic recipe! Lol calm down. I don’t think the type of butter or milk makes a difference in how pasta looks. Also linguine noodles pretty much all look the same, at least all the ones I’ve seen. She also says what milk she uses in the nutrition link anyway. I think most readers prefer the way she has it because not everyone has Silk almond milk or not everyone wants to use daiya cheese, etc. This way it is less exclusive, especially also to international readers who might not get those brands. Lol. Lindsay, i seem upset bec I really like most of her PHOTOS for her recipes — but she does this always and it isnt accurate. With each “different choice”— unfortunately the type of milk, and most importantly the type of flour, ALWAYS brings absolutly different results- even if slight. Baking and cooking is actually a science and with a slight variation it definetly turns around the end product. All I am asking for is if you are going to show a delectable photo- tell your readers exactly what YOU did. Not all the “choice” options– bec bakers and cooks will do that on their own anyway! Seriously. Calm down. It’s just a recipe post. I would have to agree with Mary. I have tried some of her recipes with what I have on hand and my cakes have been flat or gross. In the same respect, I have LOVED many recipes. Katie should post what she uses and then state that you can make substitutions. My recipes have only worked when I used exactly what Katie used. Logic. This is especially true in baking! It has long been said that cooking uses recipes (with quite a bit of room for variation), while baking is done with formulas. If the ratios are not adhered to, the results will be disastrous. Even something that appears to be simple (i.e., the fat/water content in European butter vs. domestic butters can vary widely) can have a huge impact on the result. On a more positive note, I GREATLY appreciate that almost all ingredients include the weight. If I learned nothing more as a typical “know-it-all” teenager those three summers I worked with my father in a professional kitchen was that the only way to assure consistency is by weighing the ingredients. I fully agree with you Mary. I do like that Katie gives you the “of choice” option when available, but it would be useful if she would say what she used exactly. Who knows, maybe using soy milk over skim milk will result in a different textured or a slightly off tasting sauce. Even though you can substitute these ingredients, I want to know what she uses so I can get the closest product to what I see pictured. Because it is true, if you don’t know what exact milk or flour is in a recipe you could end up with an unpleasant product. 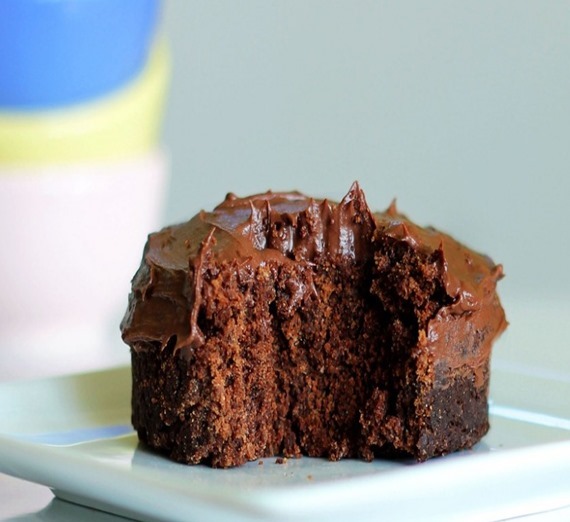 For example in cake recipes, the type of flour used is always stated. 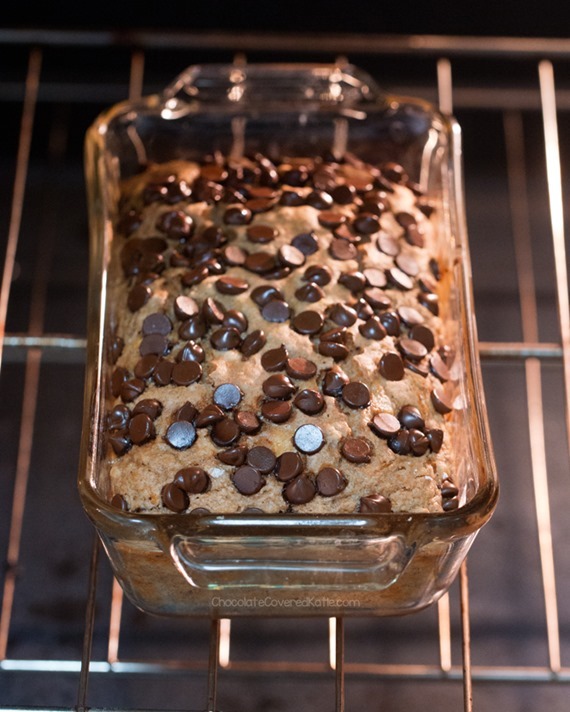 Substituting all purpose flour for self rising will make a dense cake, i.e. not what you were intending to make. True, it is not that big of a deal and most likely will not make a big difference, but it would be appreciated if Katie could specify her ingredients more clearly. We just had unhealthy shrimp alfredo last night so I’m very excited to try out your recipe and fool my boyfriend that eating healthy can taste delicious too. By the way, I have your cookbook and have made the black bean brownies- yummy- and fooled my family. Keep up the good work. It’s so cute that you say you go through at least one avocado a week, I go through at least six! I’ll try this with zucchini noodles, thank you! It is delicious with zucchini noodles and so calorie friendly! ONE avocado a week?! giiiiiiiiiirl, i have one a DAY! It looks delicious, buuut… Avocados make me gag. You say that they make it delicious, but does that mean you can taste the avocado, or does it just give it a bit of creaminess without the flavor? Sorry if that’s a stupid question, the recipe looks great otherwise! I’m trying to think from an avocado-hater’s perspective… Possibly you taste the flavor somewhat if you don’t add any nutritional yeast/cheese, but if you do add any sort Parma or melt in some cheese-type shreds, that should take away any avocado taste completely. Love this sauce! So yummy, and EASY! 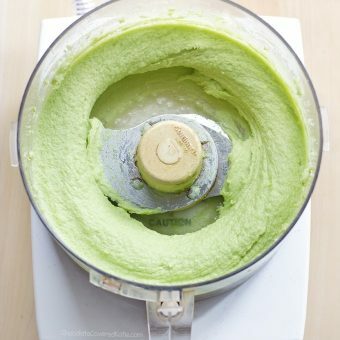 For the mashed avocado, you give a 2/3 c. measurement, and a weight measurement. Approximately how many WHOLE avocados yield 2/3 c. mashed avocado? Also, how well do leftovers keep (even if for only a day)? Leftovers keep well, but–just like guacamole–they do turn less green. As long as you’re not serving them to dinner guests, leftovers are great. It’s a little over 1 large avocado. A large avocado has around 1/2 cup flesh. 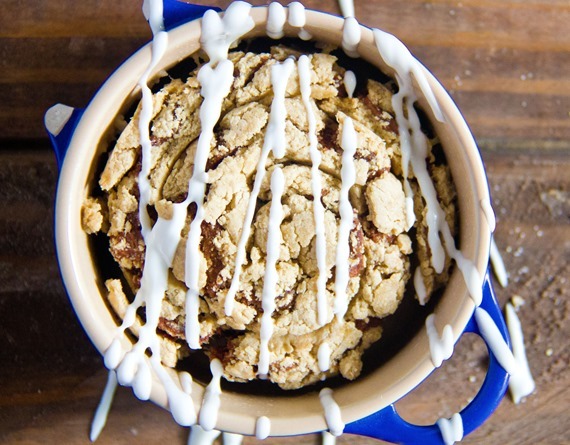 Thanks for sharing this inspiring recipe! I’ve been trying to introduce more avocado to our family menu as I know it’s full of nutritional benefits but I’ve always find it hard to know where to use it. I was planning to make some pasta today so I’ll definitely give yours a try. What is black bean pasta? Black bean pasta is pasta made with black beans. There are other pastas made of corn, rice, quinoa, etc. This is just another variation. I’m guessing black bean pasta has a stronger flavor, though, but I haven’t tried it yet. OMG, this looks so good. Lucky me, I have everything I need, at home, to make this. My favorite market has avocado on sale this week. Yay! an excuse to go buy more. This looks delish, I love the idea of having a healthy alternative to cream sauce. 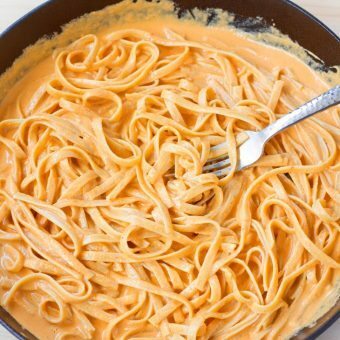 Alfredo is one of my biggest comfort foods. Thanks for giving us a new way do indulge. This recipe has me intrigued and I am keen to try it and hope that non-vegan ingredients works out like yours did. Looks wonderful. I would like to blend this at home then take it to work and microwave it. Any knowledge on how it will microwave? You can definitely reheat in the microwave! The sauce is not as much of a vibrant green the next day, but it still tastes just as good! 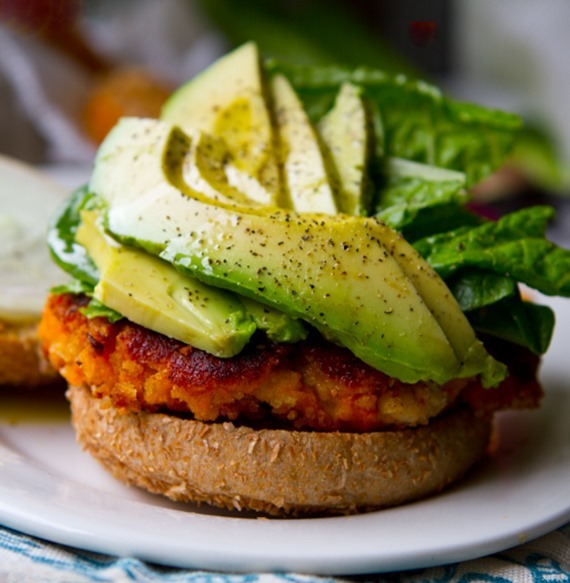 I love the look of this recipe, especially since I’m literally addicted to avocado! I’m a uni student so it’s great how quick and easy it is too. I can’t wait to try it – thanks for sharing! 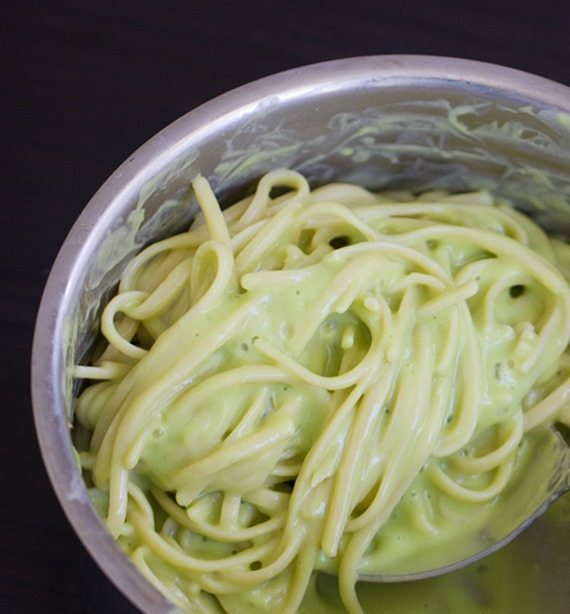 My youngest son saw me printing your recipe for Avocado Alfredo Pasta and asked what it was. I told him I was making something new. He replied, “Is it from Chocolate Covered Katie?”. “Yes”, I told him. “Well then it HAS to be good!” We all LOVED this recipe! 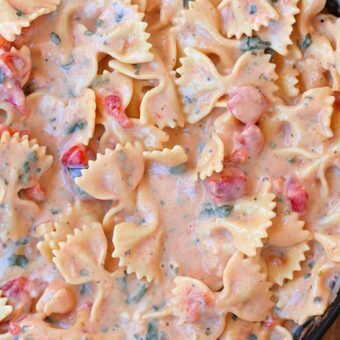 It is comfort food at its finest and SO creamy and good for us! And, we also agree that the Chocolate Mudslide from your recipe book is AMAZING! We have it about once a week or sometimes more! I think my husband would drink it every day if I made it that often. 🙂 Thank you so much for all you do Katie! You are a HUGE blessing to our family! Thank you for making the dish and commenting. I’m accustomed to a more review centric site vs sharing words on the recipe itself vs the food produced and eaten. This looks absolutely incredible! I HAVE to try it with coconut milk! Katie, as always, your recipes never fail! We had this tonight…..all I can say is we fought over who was going to lick the pan….I totally won FYI 😉 this was amazing, thank you!! I also cannot believe I haven’t made the mudslide recipe from your book! I am trying that tomorrow, can’t wait!